In my head September is the official beginning of the year just like when I was a student. It is the moment of starting afresh with new energies from the summer and new projects for the colder months. When we think of going back to work we think of all the things we need to do. However we often forget that a critical aspect of our work is related to the space we work in. Thomas Leonard (founder of Coaching University) once said that “SPACE management is more important than TIME management”. The space we work in can deeply affect the way we feel, the way we and other perceive ourselves, our productivity and motivation. This is true for all offices but becomes even trickier for those of us who work from home. Research has demonstrated that unsupportive space drains energy away preventing us from concentrating. “The difference between a supportive and an unsupportive workspace is thus the degree to which occupants can conserve their attention and energy for their tasks, as opposed to expending it to cope with adverse environmental conditions. The ‘energy’ drawn out of users in adverse environmental conditions can therefore be hypothesized as coping mechanisms or behaviour; evidence that such mechanisms are present in employees’ behavioural repertoire at work indicates a stressful (uncomfortable because unsupportive) workspace.” (The effects of the physical environment on job performance: towards a theoretical model of workspace stress, 2006 J.C. Vischer). 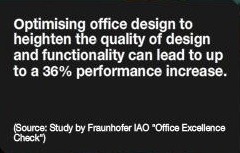 If you liked this blog and you’d like to know more about offices transformation, make sure to register to get your free kit (up there on the right). Stay tuned to see some home-office makeover pictures coming up in future posts.